This is one of our Budget series of posts to give you an idea of how much we spent traveling around the world. Here we will look at Thailand. Check our posts to see what kind of activities we did and where we stayed! 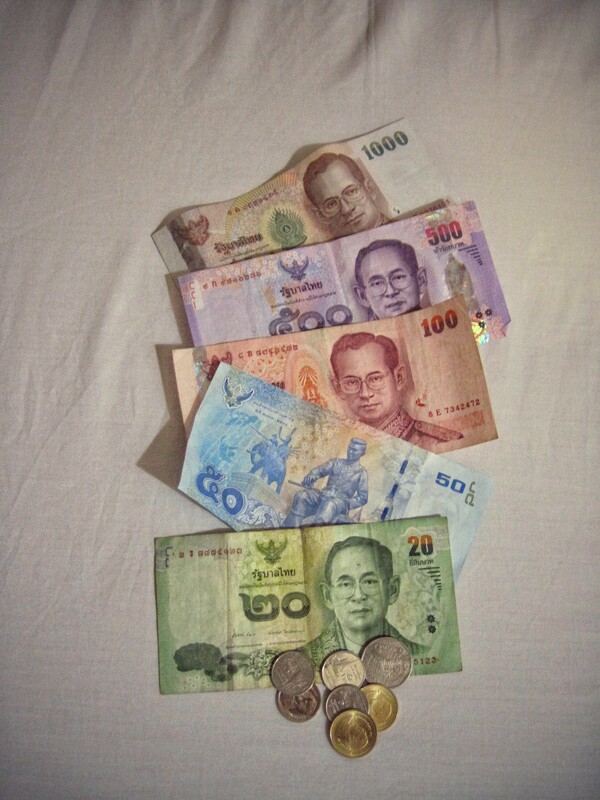 In Thailand we used the Thai Baht. We converted to US dollars using the current conversion rates at the time of our visit. It was approximately 3 baht to $0.01. We stayed in several places in Thailand. Our first time was in Bangkok for a few days in January before we headed to Myanmar. We returned to Thailand on the the 5th of March and we stayed mostly in small hotels or guesthouses. Much of our time in Thailand, we were traveling with Della’s parents. There was one hotel that we stayed at for 2 nights that Della’s parents paid for as a gift. This included a lot of things! Entrance fees to museums and wats, a movie in Bangkok, a day with elephants, a cooking class, and even a snorkeling trip! We only count alcohol costs when it is not purchased with other food. We loved the food in Thailand and often ate out for lunch and dinner. Only a very few of our accommodations included breakfast, so we often purchased that as well. This included a lot of added toiletries as well as several souveniers. It is amazing how many things we start to buy when we know that we can send it home with Della’s parents! 😉 We also had to purchase a new battery for Eric’s fitbit. We traveled around a lot in Thailand! This cost is actually quite low when you think about where we went. We traveled by bus from Chiang Rai, to Chiang, Mai, to Mae Sot, to Sukhothai, to Ayuthaya. Then we traveled by train to Bangkok. After that, we flew to Koh Lanta. This divides out to $61.53/day which is under $100/day budget! Now that’s what we were hoping for in Asia! We even felt like we splurged on activities and accommodations, and we were able to remain this low, so it just goes to show that Thailand can be an inexpensive place to travel. Yes that seems about what SE Asia should be finally.